Nearly 40 people in Gainesville this week donned the same black outfit every single day. By Friday, their little black dresses may have been dirty or worn, but the effort raised more than $8,000 for families in need. 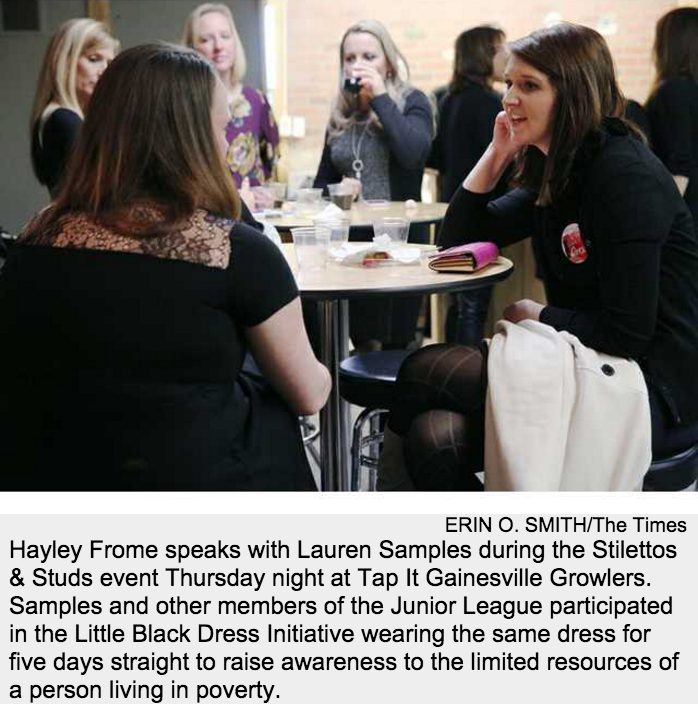 The Junior League of Gainesville-Hall County’s inaugural Little Black Dress Initiative took place this week, raising funds and awareness of poverty in the area. The league set out to raise funds for Habitat for Humanity of Hall County and raise awareness of the limited resources available to people with limited income. The “little black dress” or similar black outfit, repeated every day, represents these limited resources. Participants wore buttons that said “ask me about my black dress,” and Saxon said she was able to engage in numerous conversations with interested people, including co-workers and even strangers at the grocery store. Most participants also campaigned on Facebook and social media, to raise funds for Habitat. By Friday afternoon, more than $7,500 was raised through social media alone. “And today the donations are still just flooding in,” Saxon said Friday. A massive fundraising and awareness effort was made in particular at Centennial Arts Academy in Gainesville. “Some of the teachers, faculty, staff and students participated actually in the Little Black Dress and wore the same black outfit throughout the entire week to raise awareness about poverty,” said Randi Moore, Centennial teacher and league member. Moore said the school had two “hat days” when kids could make a donation and wear a hat to school. Through student donations alone, $240 were raised. Then Friday, they had a schoolwide blackout asking children to wear black to school to join the initiative on its final day. The campaign week will wrap Saturday with a free clothing drive at Centennial, 852 Century Place from 11 a.m. to noon. The first 50 people in attendance who need it will be given a food donation box from the Junior League’s Feeding our Future program. Saxon said she believes the initiative resonated so well in the community because of local statistics. According to U.S. Census Bureau data, about 18 percent of people in Gainesville and Hall County are below the poverty line. The league hopes to make the initiative an annual endeavor, and Saxon said they have plans to make it even stronger next year.